This stereo uses a coded Keycard to activate it, a bit like a credit card with a smartchip on it. Duplicate cards can be reprogrammed from the Master Keycard by using the menu on the stereo under the LEARN KC section. If the unit is codelocked it will need to be left switched on up for up to two hours to reset before another code entry attempt is possible. If it does not reset after this time, then all of your code entry attempts may have been used up, and the unit will need to be sent to us to be decoded and reset, details of which can be found below. If you have lost your Keycard, we can supply you the Master Code number so that you can program a new blank Keycard to be used on your stereo. The Master Code for this Radio is available NOW using our fully automated INSTANT RADIO CODE service. 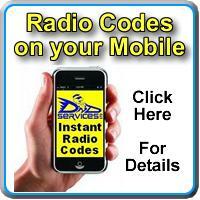 Once your Radio details have been submitted, your Code will be ready - Instantly !! - No Waiting !! At present, we have very little other information on our database regarding this stereo. We would gratefully welcome any extracts that you could send us from either the instruction or installation manuals so that we may update our records and help others with any technical assistance. Removal of the radio is fairly straightforward. The removal tools are inserted into the four round holes at the sides of the fascia until a click is felt. The radio can then be withdrawn and the leads unplugged. If you find that the Keycard for your unit has suddenly stopped working, and is now rejected by the head unit, it is possible that the card reader may have failed. Remove the Keycard and have a close inspection of the small gold contacts. If you see a very small circular indentation, about the size of a pin head, it is a sign that the pins on the card reader are faulty and that it has now also damaged the keycard. The card reader and keycard will both need to be replaced. Please contact us for more details of this repair service. If you have lost or misplaced your Keycard, we can decode and reset the unit and return it back to you along with a brand new Keycard. You will need to send the unit to our workshop for this work to be carried out. Approx turnaround time is 48 Hours from receipt to dispatch.